Inspired and designed for the Dancesport Industry, Swarovski crystal is answering the demand for rhinestones that will have the ultimate light refraction and literally sparkle with every movement. The Swarovski Shimmer Effect Rhinestones are essentially a light AB effect that shows colors more vibrantly. They are made with a softer, lighter refraction, which radiates 3 shades of the single color - bound to make any costume more elegant, glamourous and sparkle more! Serious competitors invest heavily into their sport and they know that their outfits must draw the attention of the judges from the minute they step out to perform. With completion in mind, Swarovski has combined their unmatched quality, durability and glamour with the new Shimmer effect ensuring the highest-level of performance. 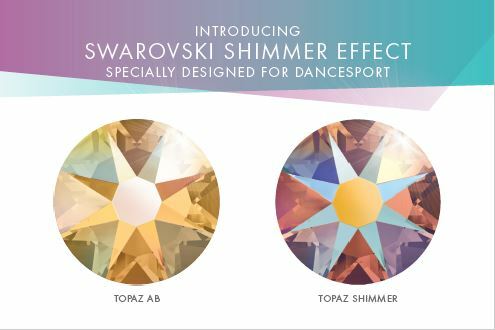 While the Swarovski Shimmer Effect was made for the Dancesport industry, its use far beyond is obvious – crafts, jewelry, crystallizing, apparel, accessories and more. Every industry can benefit from the allure of this new innovation. So whether you are looking to dazzle in the spotlight or add a new shimmering color to your designs, Swarovski Shimmer Effect Rhinestones are the perfect addition! Below is a side by side comparison of Topaz with an AB coating and Topaz with a Shimmer coating. As you can see, the shimmer coating reflects the light differently and illuminates the color of the stone within. This Shimmer Effect is ONLY available through the US market for a limited time! International customers – this is your opportunity to be the first in your country to carry this popular new coating! Har-Man Importing is proud to be one of the first to offer this new Effect. Click here to view full line available on our website. Place your online today or call us at 1-800-BEADS-NY.